Hi, I'm new here. Hopefully soon to be the owner of a wood Thompson. Just curious about how they handle. I'm used to fiberglass boats with different hull designs, (some good, some terrible) but never have driven a wooden lapstrake. Under power, at plane, do they ride on their side on a tight turn or slide around with a backside fishtail? The model I'm looking at is a '61 Sea Lancer OB. I think they handle wonderfully. But than again, I am a bit biased. I actually have almost NO experience operating aluminum or fiberglass boats. I've always been around wooden boats. I have not experienced backslide or fishtail in turns. The shape of the hull will make a big difference in handling. If there is even the slightest hog or hook, handling can be very squirrely. Is this a Peshtigo or Cortland built boat? I am keeping a database of these vessels. 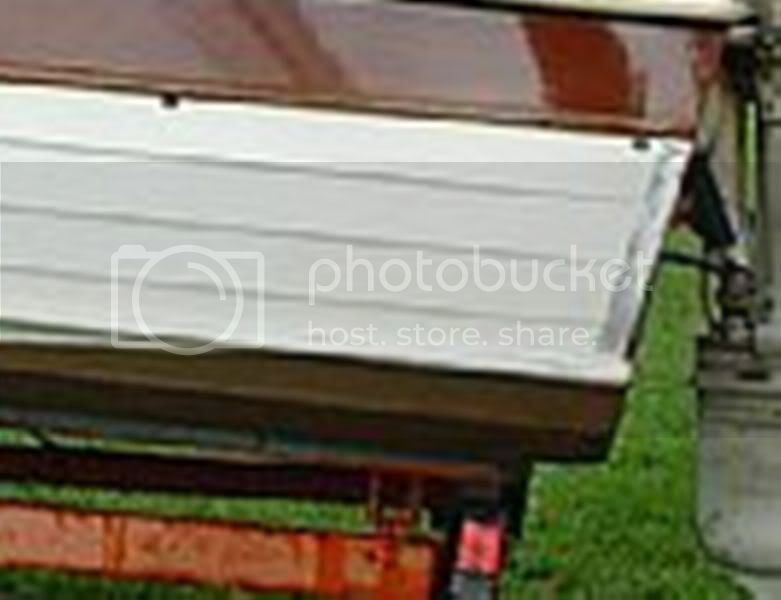 What is the serial number on the small metal plate and what is the hull ID stamped into the wood of the transom, inside the boat? Thanks for the welcome! This is a Cortland built boat, the one I sent pictures of to you recently. Has a '62 Merc 700 on it. I don't have the numbers from the boat yet, but I will forward them to you if/when I do get them. Thompson lapstrake boats corner much like a fiberglass v-hull. For their size and weight I think you find the ride is better with the lapstrake. The ribs give under the pressure of an incoming wake which absorbs some of the shock. The more rigid fiberglass hulls have less give. Andreas is right about even a small hook being a problem. Having power trim on the motor is a significant advantage on any boat, but particularly a lapstrake. It makes driving our 18' 4" 1963 Super Lancer nearly effortless at cruising speeds--and we still use the original 'cable" steering. Good luck on your project. We rarely take out our fiberglass boat unless we have a crowd to transport. Thank you for your information John. The Merc 700 on this boat is not blessed with power trim, but I've seen sources for new or used parts to convert it. The hull will need to be inspected closely for a hook. The boat (for most of it's life) used a short trailer with a tilt, so I'd assume that means it had rollers. For the last 3 years it's used a longer trailer with bunks but they stop about 6" short of the back of the transom. This photo has been enlarged and it's blurry, but it appears that the bottom of the hull curves upward for those last 6" or so. It may be an illusion, but if that's the case, a longer bunk wouldn't support the hull in that area anyway. Is this a typical hull design of a '61 Sea Lancer? Now you are better getting advice from Andreas and others than me on this question. Generally, my experience is that the boat is in contact from the stern forward until the bunk ends. That's a VERY frightening prospect if the transom has not been supported for all these years. That's exactly how a hook or hog develops. A quarter inch can make the handling at more than idle speed very scary. That photo really can't do justice. I'd suggest you inspect this boat personally and have a long straight edge with you. Try to determine if the bottom is straight. It might be difficult to do when the boats on the trailer, but try your best. Andreas, That photo makes me sick! What about the slight upward turn just before the transom that is seen in my photo??? What is the TRUE contour of the hull of a '61 Sea Lancer just in front of the transom??? The bottom should be flat bow to stern. I don't know if the bottom in that picture is turned up. Hard to tell. And I don't know how it would affect handling. W Guy, get some yarn or string and hold a piece to the hull under the helm and stretch the other end tight over the transom, the same distance out from the keel at each end. You can do this even while the boat is sitting on the trailer. I'll bet at some point your hull is concave. If the string isn't tight flush to the hull, that's where handling problems come from. My boat sat unused on a roller trailer for several years and that "hogged" the hull. About three feet forward of the transom it was at least 25mm out of fair. At speed, the depression just sucked the hull down hard on the water so the boat would list to one side or the other. That would require counter-steering until you had enough cranked that the boat would turn, lifting one side of the hull off the water and flopping over onto the other. The marina hand who decided to take "the old woodie" out for a spin around the lake almost lost control of the boat it handled so badly. If you find the hull has concavity, see earlier posts about Wade Strong's method for "hull jacking" - a simple way to cure hog. Although I did it while out of the water -- which I recommend. The topic of "hogging" is always interisting and, unfortunatly sad. i was trying to refresh my memory on the Wade Strong hull jacking, but couldn't find the old post. i have often thought of how I would tackle the hogging problem if I ever had the misfortune of encountering it. I think rather than simply loading the hull from the inside, this tending to pull out the fasteners at the transom, I would create a balanced loading by pressing the hull longatudinal stringers down to strong back beams. let me explain... position straight beams port and starboard running from the transom forward, drill thru the hull for threaded bolts, install strong backs inside the hull to distribute the load from the bolts and gradually begin screwing down the bolts over time. the beams could be back to back channel irons with spacers or perhaps 4X6 timbers. in any case this would be a controlled and gradual application of force that would not risk pulling the garboards away from the transom. Afterword just have to plug up the bolt holes. Think this would work??? comments/ thoughts?